We know that filing for bankruptcy can be a stressful ordeal. And while you may feel relief after your case closes, the decisions you make in your life after bankruptcy are just as (if not more) important. 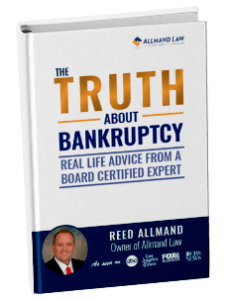 To learn more about how to regain control of your finances after filing bankruptcy, contact a skilled bankruptcy attorney at Allmand Law Firm, PLLC today. You should monitor your credit reports with all three of the major credit report bureaus closely. Equifax, TransUnion, and Experian will all record your bankruptcy activity. This means that your bankruptcy will be reflected on your credit reports; however, your debts should be listed as discharged. Creditors should update the status of your debts within three to six months. Dispute anything that looks inaccurate on your credit report. You may have kept your home, car, and other property that you wish to continue paying after your bankruptcy. Those creditors will want you to reaffirm, or validate, that debt. This can be done with a formal letter or form that the creditor may mail to you. This will allow you to keep your property in life after bankruptcy. In life after bankruptcy, you will be sought out by new creditors and offered new credit cards, loans, and other debt. Avoid that debt unless it will improve your financial situation and you can afford it. You should have worked with a financial advisor who can help you stay on a straight path to avoiding unnecessary debt in life after bankruptcy. Your credit score will likely take a dip when you file bankruptcy; however, you can begin rebuilding it right away. Once you eliminate the majority of your debt, you can work with a budget to establish good credit habits. This may include a secured credit card or a car loan in life after bankruptcy. These can help your overall credit score and improve your situation in life as well. In life after bankruptcy, you must maintain a responsible relationship with your credit. This includes paying bills on time. A financial advisor can help you build a budget and understand when and how to pay bills. It may seem obvious, but paying bills on time can be a difficult endeavor. You must ensure that you have enough money at the right time each month. Work with a professional to make a better financial life after bankruptcy. When you filed for bankruptcy, you were required to take credit counseling courses that helped you learned about bankruptcy and finances. You can also take budgeting courses that will help you learn about monthly expenses and how to use your income wisely. It’s important to stick to a budget in life after bankruptcy so you don’t end up in debt again. Life after bankruptcy will begin when your bankruptcy is finalized and the court discharges the remainder of your debt. For a Chapter 7 bankruptcy, that may be four to six months, depending on how long it takes you to complete paperwork and have necessary hearings. For a Chapter 13 bankruptcy, that may be three to five years, or whenever your payment plan concludes. Although the bankruptcy will be on your credit report, you can begin rebuilding your credit right away. You may use some of the strategies mentioned in the list above to make sure you keep a clean financial slate and rebuild your credit. If you have questions about filing bankruptcy or how a bankruptcy will impact your life, contact us today. We have worked with countless clients and helped them start fresh in a debt-free life after bankruptcy. Call Allmand Law Firm, PLLC today to find out how we can help you.